UMass Boston professor Krysten Hill read some of her poetry during a Writers Resist event at Boston Public Library on Sunday. People who were interested in attending but could not for lack of room milled around and listened to readings outside Rabb Hall. The “promise of democracy” that Martin Luther King Jr. spoke about in his iconic “I Have a Dream” speech feels very distant today, but not just because of the controversial recent election, Daniel Evans Pritchard told a somber audience at a “counter-inauguration” hosted by a group that called itself Writers Resist. Writers Resist is a network of activist writers founded in response to the election of Donald Trump as the nation’s 45th president. The writers united in concern about the preservation of democracy in light of his rhetoric and proposed policies. A protest in New York — the flagship event — was accompanied by more than 90 other protests scheduled in other cities across the country Sunday, King’s birthday. The PEN America literary association sponsored the New York event, and the New England chapter sponsored the Boston Public Library event. The diverse group that performed readings at the Boston Public Library addressed issues ranging from racism and homophobia to disability activism and Planned Parenthood. The word, which means acting higher than your class, is never used for white women, she said. Only women of color, like her — and her mother. 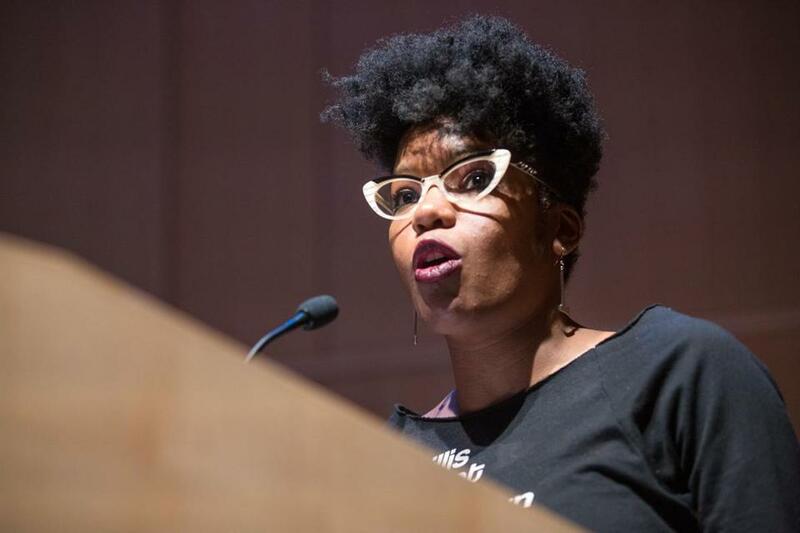 To thunderous applause, poet and UMass Boston professor Krysten Hill read aloud a poem she wrote about the helplessness she felt when witnessing a knife fight between two boys outside an Orange Line station. It was the same kind of helplessness she feels when she can’t protect her own students from violence, she said. Many other readers spoke with angst and defiance about the same theme of helplessness. And when society is facing such a level of uncertainty, they said, that is when the arts are the most needed.